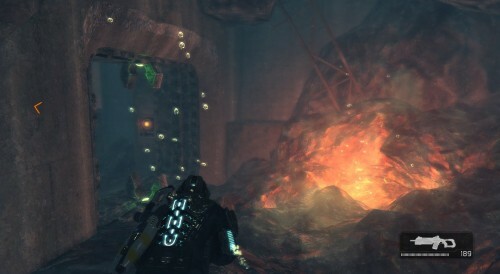 Not too many games can claim that they allow an underwater shooter experience, and Deep Black: Reloaded is that exception. We as gamers are normally faced with some sort of land based terrain because it is the most probable type of warfare. 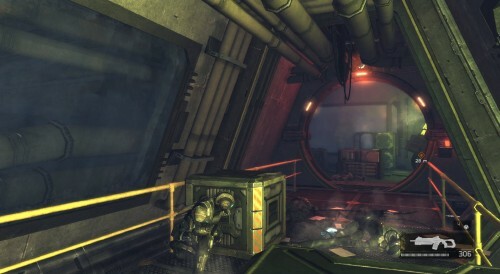 While this third person shooter also provides land combat, underwater zones occur quite readily and impose unique movement controls/tactics. With an innovative combat scene and underwater exploration, let’s see where Deep Black: Reloaded ranks against its soil bound competitors. Lacking an initial storyline, players jump right into the game without much guidance or purpose. What we know is the current year is 2047, and the world is being controlled by several megacorporations that hold substantial military power. The three main corporations mentioned are Ishiguro-Himmel Systems (IHS), Global Strategic Alliance (GSA), and The United Federation of Gondwana. IHS is based in Berlin and maintains the most power amongst the three organizations. The northern hemisphere is controlled by the GSA while Gondwana operates from the southern. As you begin your journey, you come to learn that the main character, Syrus Pierce, has been hired by the independent military organization CHARON which stands for Chief Amphibious Reconnaissance Operations Network. The reasoning behind the missions is misguided, and you will join in the confusion that Pierce expresses from act to act. Starting as a mere reconnaissance mission, acquiring intel quickly turns sour as IHS agents openly attack. The story seems very weak starting off but progressively becomes more apparent as we learn the background of Pierce and his old teammate Velasco. Completing objectives will garner further information, but I found that focus is lost on the story as the here-and-now becomes devastatingly more important. Cut scenes will refocus attention to the story but soon drowns out by beautiful scenery and constant addictive gameplay. Operating like any other third person shooter, Deep Black: Reloaded takes this genre a step further by providing a 3D underwater battlefield. In water you encounter a freedom of movement that cannot be felt on solid ground. This freedom is enhanced by the specially designed jet pack on Pierce’s gear. Controlled by a cool-down timer, the jets can be administered by pressing the “spacebar” and the direction of interest. Working as a propulsion, the suit’s jets aid in avoidance as well as maneuvering around currents. The jet pack is not the most interesting addition to the suit. An integrated harpoon proves to be much fun in not only converting working drones but also grappling land opponents from water – not to mention you use the harpoon to solve puzzles. Having several types of weapons will increase the fun factor of a game as long as the mechanics behind the weapons work. Normally, a realistic weapon such as a pistol or rocket launcher has base mechanics that gamers have an inkling about. For instance pistols provide small amounts of damage with a limited clip. Keeping this normality gives a reliable back-up or main weapon and allows the player to be comfortable. A player is allowed to carry three weapons at any time, but the pistol remains constant and cannot be unequipped. 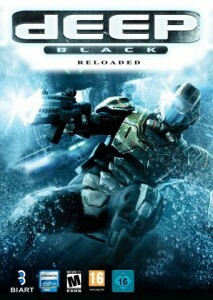 Going beyond the normal realm of weapons, Deep Black: Reloaded explores new technology in a futuristic Earth. In part with the storyline a meteorite is found that contains a new element. Nicknamed XS, an electric current can be attributed to the metal and increase its power. The IHS organization has been prototyping new weapons, and one such weapon created with the use of the metal is the Stun Gun. Mechanics behind the weapon produces a charge that paralyzes its target momentarily. However, several shots of this weapon can be devastating and cripple opponents as easily as using a shotgun. Careful, you just might wet yourself. While a variety of weapons is important, enemies too need to be varied. The IHS is full of surprises but their main slew of enemies are in similar wet suits or look like engineers. 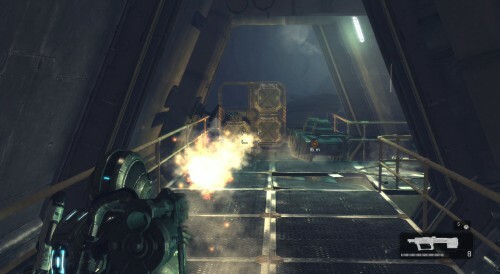 Wielding light machine guns and shotguns at the start, these enemies provide little threat if dealt dwindled down. Shotguns up close can be very deadly, so pressing (F) as an enemy gets really close will administer a deadly melee attack. Some enemies wield dual blades at their wrists and charge towards your position. Be quick to take these foes down or initiate a melee attack to prevent being killed. Armored opponents are tougher to kill, but not as tough as some of the boss battles. 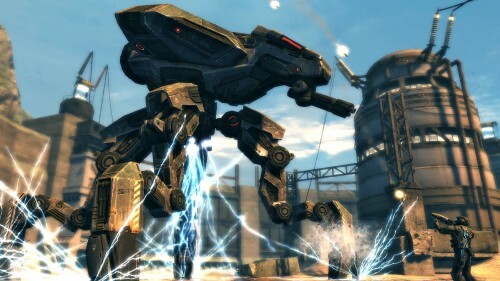 A series of metallic crab tanks will provide a challenge as you will need to utilize your environment to defeat them. In one such battle, you will need to overcharge a transmitter with a Stun Gun. The transmitter disperses the charge to the water below where stands the gigantic metallic creature. As the machine is stunned, its weaknesses become visible. Only by continuing this process will the goliath tumble down. Understanding your environment is absolutely essential to survive at higher difficulties. No longer can you run and gun, and come out unscathed with foes beneath your feat. Cement blocks, metal sheets, machinery, as well as pipes can provide cover for incoming missiles. Careful advances from cover to cover is recommended and will guarantee a chance to surpass a level. One aspect that enrages me is the death screen. Upon dying you will normally enter a screen that will ask you provide a respawn to the last checkpoint by hitting “enter”. However, once in awhile that screen changes, and the “enter” command will restart the entire level – not so much fun. This might occur if you continue to die at your checkpoint, but the alternate screen will screw you up at least once during your gameplay. If you die, you will be patient to see what screen pops up or start all over. Dressed from head to toe in an advanced scuba technology, the main character Pierce is able to move from water to land without too much trouble. As a player moves Pierce from water to land, the screen will become slightly blurry for a few seconds as water would be running off armor. Cosmetically this provides a realistic concept that environment will affect visibility for a minor duration. Additionally, leaving the water will cause the suit to depressurize acting similar to a semi releasing tire pressure. Such a tiny addition makes the game artistically creative and appealing. I cannot imagine how much time was put into making the underwater scenes – the graphics are outstanding. Jetting over volcanic geysers is only one instance that stands out as an intuitive design. As your character passes through the visible heat, burns will dot the screen with large red spots. Is death a worthy price for enjoying creativity? I think so. The dying sounds for every human enemy stays the same masculine yell. I first thought a foe was running towards me at the sound of the clip, but I eventually became aware when no one was running wildly in my direction. While the sound is funny, it can be confusing with a charging opponent. Perhaps more death voices would make killing individualized. 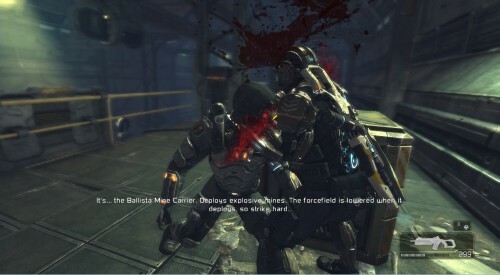 As a mainstream third person shooter, Deep Black: Reloaded would not live up to the big name titles like Gears of War 3 or Mass Effect 3. But the game is in fact an indie developed game, and does provide a product worthy of playing over. I felt the positives outweighed the negative aspects of the game. The level designers were hard at work and proved that even indie games can look amazing. Repetitive sounds and an annoying death interface will occasionally be distracting, but the exciting underwater battles and variety of weapons will retain more of your attention. Is the game worth the cost? If you are a sci-fi intrigued gamer, this could prove a worthy game for your collection. My advice would be to wait for another price drop from the developers as you can already purchase it at a discounted rate.